The mystery object did not behave like any known kind of supernova. It is not even in any detectable galaxy. 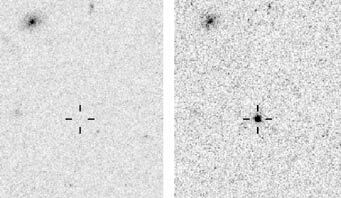 "The shape of the light curve is inconsistent with microlensing," say the researchers. They recorded three spectra of it - and its spectrum, they write, "in addition to being inconsistent with all known supernova types, is not matched to any spectrum in the Sloan Digital Sky Survey database" of vast numbers of objects. "We suggest that the transient may be one of a new class."